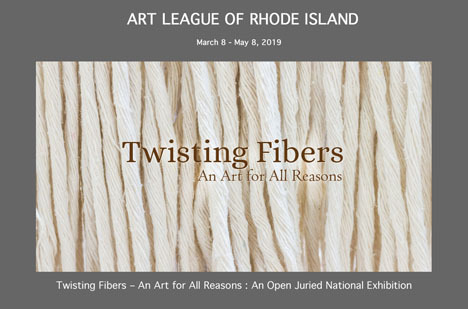 The Art League of Rhode Island will host Twisting Fibers, a national juried exhibition, featuring fine art and craft constructed of diverse fibers in creative ways. 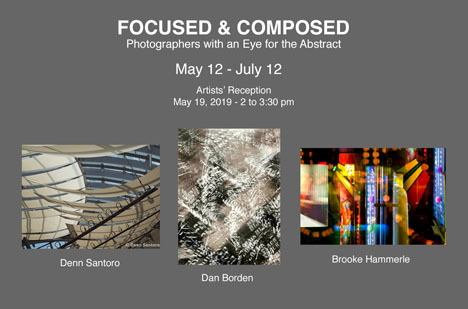 On display will be the work of three photographers whose interesting and imaginative images of patterns, shapes, lines, tones and color are discovered through the viewfinder of their cameras. Denn Santoro is inspired by the architecture of museums while Dan Borden captures movement through his lens. On the other hand, Brooke Hammerle presents us with the colorful chaos of a video parlor. 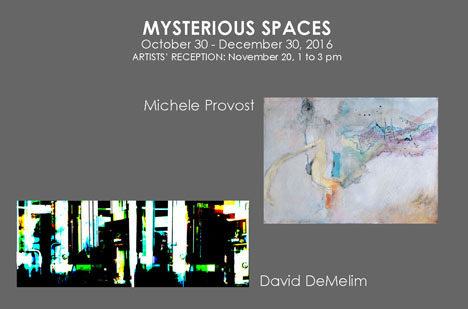 On exhibit are paintings by three artists whose abstract images allude to a source of inspiration from natural or built environments. 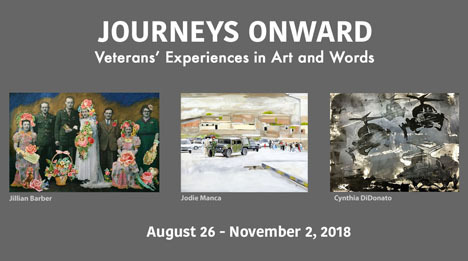 Curator, Paul Murray, has organized numerous exhibitions throughout Southern New England that have featured artwork by regional military veterans and their immediate families. These exhibitions have provided artists with the opportunity to share their military experience through art, thus fostering communication between military and civic communitiies. The artwork on exhibit depicts diverse subjects in a variety of mediums. Accompanying each piece is a written commentary by the artist offering insight into the persoanl meaning of the work. We gratefully thank them for their service. 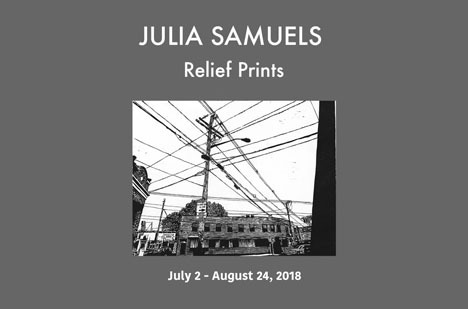 Printmaker, Julia Samuels, showed relief prints in this solo exhibit. Samuels is primarily a woodcut artist but is versed in all forms of printmaking. Her work focuses on congruence, dissonance and resonance between plant based and life forces and human intervention. Mary Dondero’s drawings capture energy and gestural movements that convey a fundamental human quality that transforms marks into feelings with meaning. 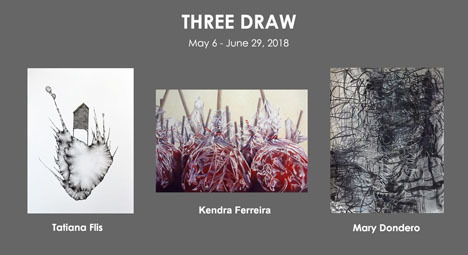 Filling the field of her paper, Dondero choreographs a build up of spontaneous strokes into complex webs, tangles and patterns that connect with the viewer at a instinctual level. Tatiana Flis draws subtle forms and images that explore relationships between the human psyche and moments of chaos, solitude, tension, excess and absence. Employing a surrealist language, she combines diverse imagery of the built and natural landscape in unlikely ways. The meshing of the fluidity of water media with the tightness of ruled architectonic forms hovering in empty spaces infuses her drawings with intrigue. Kendra Ferreira works with colored pencil depicting ordinary subjects in focused, heighted and extraordinary ways. Colored pencils permit her to fuse the expressiveness of painting with the control of drawing, and by doing so; she is capable of conveying emotion, luminescence and compositional rhythms. Her drawings are bold and delicate, transparent and sturdy. 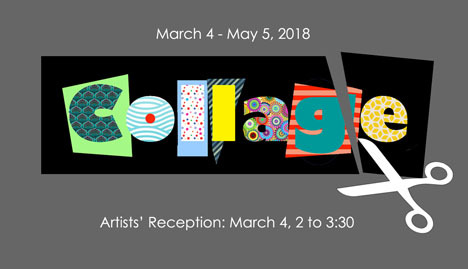 On exhibit will be artwork by artists who compose imagery from an assortment of cut and pasted printed papers, materials and media. 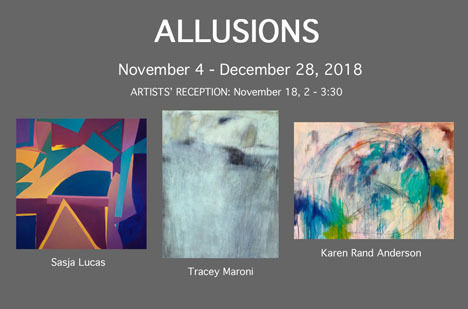 The gallery is featuring the work of three artists who design, express, and create abstract images with extreme contrasts of tone. Louise Laplante creates collages from vintage print materials over which she superimposes motifs and symbols. The bold graphic images contrast with the small-scale pattern of the text, but connect through a related theme as the aged and contemporary unite. William Clark is a photographer who captures abstract marks with light. He approaches the process as an artist might with a pencil, but while the pencil of light remains still, the paper (camera lens) moves to record glowing, intricate patterns. X Bonnie Woods works with folded paper to create three-dimensional planes on which she explores the luscious richness and fluidity of sumi ink marks, washes, and reticulations. The folded shapes of her paintings become irregular and risky, and frames cannot contain them. 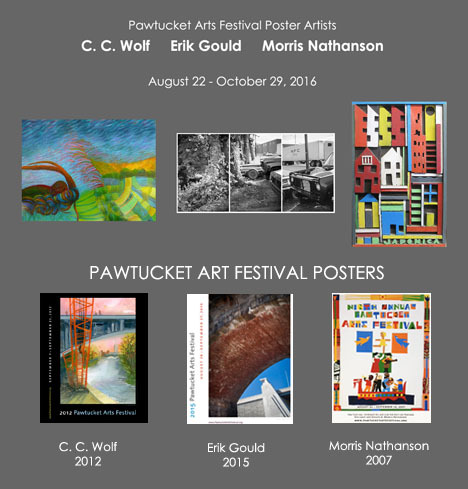 On exhibit will be the artwork of three artists who have provided images for posters for the annual Pawtucket Arts Festival. These posters, which have become collectors' items, are limited editioned, signed reproductions that reflect the spirit of Pawtucket. Two of the artists, Penelope Manzella and Gretchen Dow Simpson depicted historic brick mills with smoke stacks, scenes that are seen throughout the city that reference its once thriving industrial economy. B. Lucy Stevens' poster captures the spirit of the arts festival that takes place in a city that is redefining itself as an arts community. 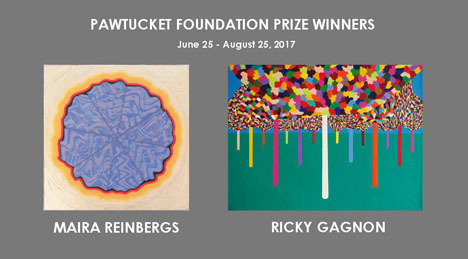 Each year for the past ten years the Pawtucket Foundation has awarded a cash prize of $1000 to an artist exhibiting their art in a juried show sponsored by the Pawtucket Arts Collaborative. The work of two of the prize winners, Maira Reinbergs and Ricky Gagnon, will be featured in an exhibit that will sing with color. Reinbergs' abstract paintings display subtle and nuanced colors within a minimalist structure enhanced with patterns inspired by music. While her paintings glow and radiate color, Gagnon's paintings pop and bounce with a riot of color. He paints personal imagery in a decorative manner and often pushes them over the top with beads, glitter, and pastic ornaments. Both artists create joy! 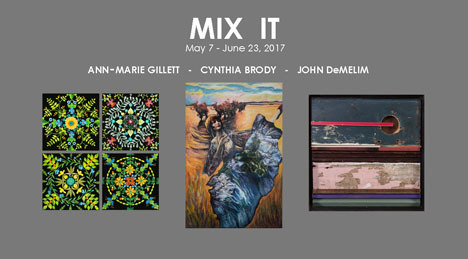 On exhibit is the work of three artists working in different styles, each using a mix of materials. Ann-Marie Gillett creates small, intricate floral mandelas with colorful painted tape while Cynthia Brody combines photographs with paint to depict surreal environments inhabited by fanciful and exotic women from various cultures. John DeMelim collects objects and scraps of wood to combine into abstract wall reliefs where textures and colors are harmonized within strong graphic parameters. 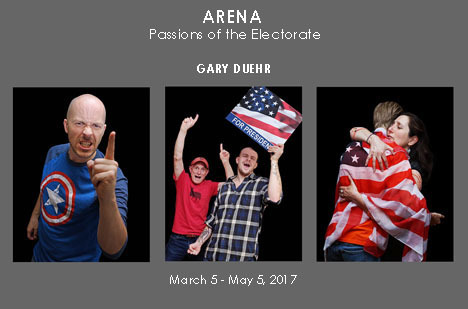 Boston based artist, Gary Duehr, was chosen as a Best Emerging Artist in New England by the International Association of Art Critics. He works in photography and video and shows his work in galleries and museums internationally and as public art installations. His awards include a Massachusetts Cultural Council Fellowship and grants from the LEF Foundation and the Rockefeller Foundation. Gary Duehr is also a published poet. Paintings with subtle colors and delicate, organic forms by Michele Provost are exhibited with the bold architectonic shapes and bold contrasts of color of David DeMelim's digital prints. The two well known Rhode Island artists share the gallery with completely different work in form, content and media, yet each artist infuses their art with mysterious spaces that draw the viewer in. On exhibit is the artwork of three Pawtucket artists who were selected to create poster images for the annual Pawtucket Arts Festival. Morris Nathanson, who created the 2007 poster, will exhibit wood reliefs with a strong connection to Pawtucket both with imagery and materials. The 2012 poster was created by C. C. Wolf, who will be exhibiting abstract paintings full of color, pattern, and movement. Photographer, Erik Gould, will be exhibiting a series of photographs taken while walking the Moshassuck River. 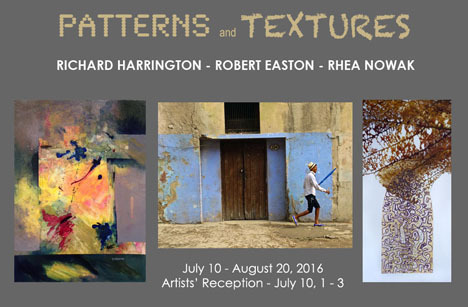 Abstract paintings with lucsious color and spontaneous brushwork by Richard Harrington are on exhibit with photographs by Robert Easton and mixed-media prints by Rhea Nowak. Easton captures the colorful buildings and walls of patina in urban Cuba while Nowak plays pattern and textures off of each other in a series of prints with restrained compositions. 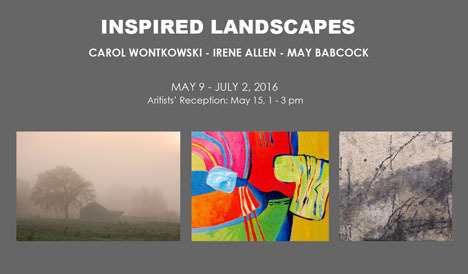 On exhibit will be the work of three artists inspired by landscapes. Misty landscapes of delicate hues photographed by Carol Wontkowski will complement the abstract prints on highly textured handmade paper by May Babcock. Bringing vibrant color to the exhibit are the abstract paintings by Irene Allen. 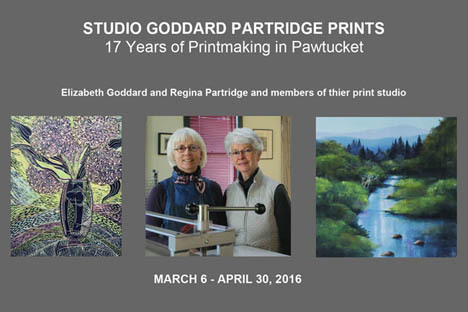 Printmakers, Elizabeth Goddard and Regina Partridge, established a printmaking studio in a spacious, lightfilled space in a converted cardboard factory on Exchange Street in downtown Pawtucket, Ri in 1999. Since then the two artists have shared their space with other printmakers interested in creating woodcuts, monotypes, and intaglio prints. The exhibit showcases the work of these printmakers. Alexander Budnitz, a photographer, will be showing work along with his mother, Toba Weintraub, a painter, and his mother-in-law, printmaker, Margot Rocklen. Although connected by family, the artists work in different media, styles, and themes. Budnitz, a Boston-based graphic/web designer and photographer creates prints of manipulated and enhanced photographs combined with graphic elements, digital effects, and carefully considered compositions. The results convey moodiness, nostalgia, and/or intrigue. A series of paintings by his mother, Toba Weintraub, a resident of Pawtucket, RI, depict views from her window that overlooks the Blackstone River. With simple shapes, painterly textures, and skillfully nuanced colors, Weintraub captures the essence of the seasons of the year. Margot Rocklen, on-the-other-hand, is a printmaker from Connecticut who works with a bold color palette and lots of pattern. In her Piscine Series, fish swim though aquatics delightfully energized by abstract shapes and swirling forms. The diversity of the work on exhibit reveals three different creative impulses and aesthetic sensibilities carried out in various creative mediums. 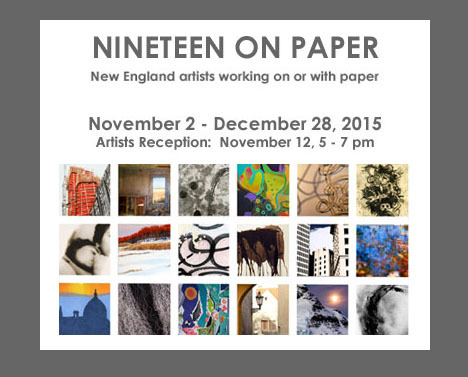 19 on Paper, founded in 1986, is an organization of New England artists who create works of art on or with paper. Members are painters, collage artists, printmakers, book artists, photographers, digital artists, and sculptors. The group has exhibited extensively in galleries and museums in New England and abroad. Individual artists of 19 on Paper have exhibited worldwide and several have been published in a variety of print media. The members of 19 on Paper believe that encouraging diversity of creative expressions on or with paper energizes and enriches the experience of all members in the group. Not only do artists work in different mediums and techniques but also with a variety of imagery, from realism to non-objective abstraction.